This entry was posted in Admin, Community, HE, international, Legals, Students, University and tagged Administration, campus, Chronicle, crime, guns, HE, international, Students, universities by Paul. Bookmark the permalink. I think it goes back to exactly what you say in your blog – the traditions of the USA – it is engrained there from ‘kindergarten’ that the constitutions of the United States is what the country is built on and the second amendment “the right of the people to keep and bear Arms, shall not be infringed”. Given the location of the study also it is likely that many of the sixteen per cent that hold a fire arm were brought up by parents (again likely to have studied in higher education) who owned a gun. I agree with you entirely that the statistics are shocking and in a society which is the biggest and most knowledge rich in the world you would think that it would be better. But if the gun lobby is anything to go by, I dont see it changing any time soon. The guns are for use against those who will not listen to your rational argument and who will – unless stopped by force – injure or kill people on college campuses. 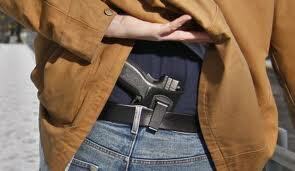 In the U.S. people with a concealed carry license are some of the most law abiding citizens there are. They may sometimes be arrested for a firearms violation, but at a rate very slightly less than sworn police officers being arrested for a firearms violation, a very low rate indeed.